Quite a few entrepreneurship heavyweights have weighed in on the issue of quitting. Paul Graham, founder of Y Combinator, one of the leading accelerators in the world, says that companies fail for one reason and one reason alone: The founders quit. Ben Horowitz, who founded LoudCloud, which sold to HP for $1.6 billion, and founded venture-capital firm Andreessen Horowitz, says that people who quit are actually just punking out. Let’s face it: Startup life is brutal. The failure rate is high. Even the companies that succeed face long, grueling slogs. You also have to deal with a constant stream of criticism, from customers, competitors, co-workers, and sometimes, investors. If anything goes wrong, rest assured, it’s your fault. And startups often rip you from your comfort zone on a daily basis. There is no soft couch to sit on. You are usually in a fight for survival, relevance, attention, sales, revenue, talent, and funding. Relax for a minute—and you’re toast. That’s why I tell my students contemplating launching new ventures that the first thing they need to get right is their mindset. This precedes all the other preparation they need to perform. Fledgling entrepreneurs really need to figure out how much they care about what they’re doing and whether they have the right mental approach. That’s why, as an early-stage investor, I am always looking for entrepreneurs with this same mentality. So what kind of mindset am I talking about? 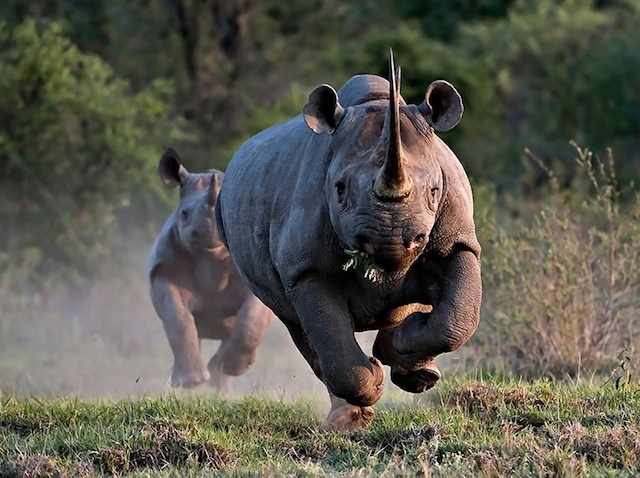 When people (competitors, critics, customers, rivals, coworkers, investors) start taking shots at them from all angles, great entrepreneurs, like rhinos, just keep moving forward deliberately and the flack just bounces off. They have unbelievable focus and tolerance for pain. When they encounter adversity, they never hesitate to turn to face it and start a charge. After a while, people start to realize something: Don’t mess with the rhinos. Rhinos never, ever quit. They persevere until they win. Period. Those of you with kids must be familiar with the suite of delicious, organic baby foods made by Happy Baby (now called Happy Family). I certainly am, as my wife and I buy the stuff by the box for our kids. What you might not know is that Happy Family was founded by a Columbia Business School alumna by the name of Shazi Vizram, who grew the company into a big-time brand that was recently acquired by international powerhouse Danone. Vizram realized her original vision of putting healthful, delicious, and nutritious food into our babies instead of the preservative-laden crud we’ve been feeding them for so long. Sounds warm and fuzzy, doesn’t it? I’m sure the press will tell this feel-good story over and over again. But what’s the reality? Well, as Vizram told my class during a guest lecture, and has said in interviews, her business went through some very hard times during the six or seven years it took her to build it. Initially she realized her early go-to-market strategy of trying for space in the frozen-goods section of stores was not working. She was trying everything she could to salvage the business, but she was running out of money and floundering. To add insult to injury, she then learned that a family member had fallen seriously ill and she realized she didn’t have enough money for subway fare. But she kept moving forward and wouldn’t relent. Days later, to her amazement, she was featured in an advertising campaign during the Super Bowl! This got her great exposure and bought her precious time to close some critical deals. She managed to turn the company around and hasn’t looked back since. She is a true missionary, pursuing her dream of getting children access to nutritious, organic food—and she’s also a mama rhino. Contently is a marketplace that matches freelance writers with a ton of major brands, including OPEN Forum, who themselves have jumped full throttle into the content-production game. The company has raised millions of dollars in venture-capital funding and have made a sizable dent in the market already. Shane Snow and his co-founders are young, brilliant guys who made a big bet on their vision that the world was moving in the direction of brands as major producers of content on the one hand and increasing numbers of freelance/independent writers on the other. Nice story, right? The reality is that Snow and his co-founders had kicked things off and hadn’t received much of a reception. They had no large brands as clients and revenue was paltry at best. As a result they were having huge problems raising any money. Things deteriorated to the point where Snow had 48 cents left in his bank account. But the team stuck together, hustled, and stayed positive. They just kept moving forward, meeting with investors and trying to bring on new clients. Days later, they were accepted into one of New York’s best accelerator programs (TechStars NYC), got some funding and soon were introduced to some larger brands they were able to bring on board as clients. Within three months they had landed some major brands and closed a very competitive Series A venture round and were off to the races. Snow and his co-founders are true missionaries. But to me these young entrepreneurs were also a herd of baby rhinos, who just kept moving forward undeterred at every step. So if you’re thinking about launching a new business, think very hard about whether you care enough and whether you have this kind of mindset. It’s something you can’t pretend to have. It’s not something you can learn. You either have it or you don’t. And if you’re already running a business, just know that the hard knocks you’re taking are “par for the course” and you just need to keep moving forward. Be relentless. Go the way of the rhino.